I finally got some pictures of my first successful 2019 Make Nine projects (the story of the failures is for another day) so thought it was time I shared the journey. This is the tale of making the New Look 6567 and I’ll give you a heads up, it is going to be a long post as it was quite a trip. However, as the title says, I learnt a lot so who knows maybe you will too? I think this will be especially helpful for those petite sewists or anyone who has had trouble with gaping necklines/narrow shoulders out there. Yes, I know its already nearly the end of the first month of the new year but shhhhh. Today’s post is super exciting – for me at least – I MADE MY FIRST JEANS!! It was my new years resolution for 2018 to add that string to my bow so seems fitting to be writing about it at the beginning of 2019. Hello hello from a very wintery Asheville! 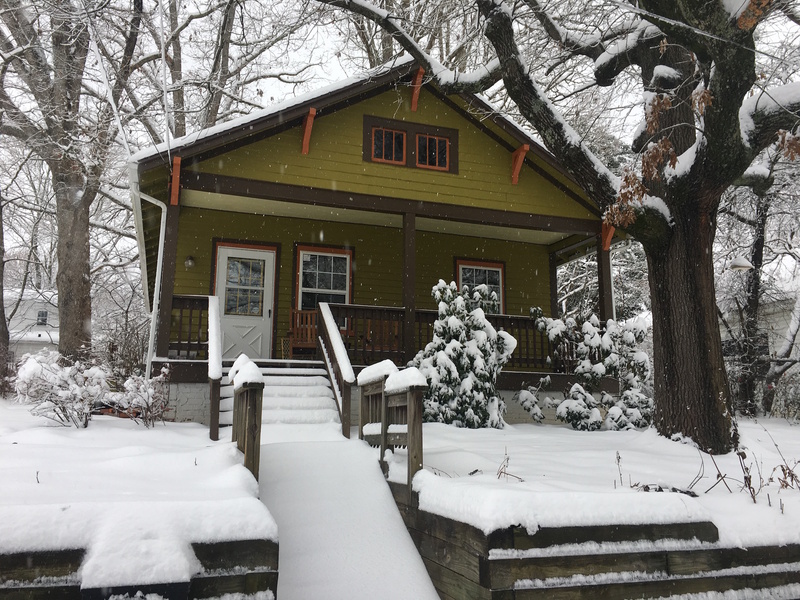 We had our first snow of the weekend and sure made our little house look magical – now we just need to get some lights up so it can look magical AND festive! Time is on fast forward I swear, I can’t keep up – perhaps that’s why I’m blogging about a dress I made for a November holiday – ha! Anyways, here’s the details on my latest make there Deer and Doe Arum Dress ! I am pleased to say, the second of my simultaneously sewn projects is done! I finished my Closet Case Carolyn Pyjamas from the most amazing donut and rainbow print flannel, a few weeks ago, just in time for the temperature to turn. Here’s to curling up on in my armchair with a good book, an even better coffee and these bad boys! in my last post I told you I was attempting my first set of simultaneous projects (I usually only ever have one on the go at once); working on both a set of Closet Case Carolyn Pyjamas and a Marilla Walker Evan skirt. I managed to finish my burnt orange skirt just in time for the leaves to change and fit right in – hooray! Happy Autumn guys and girls! It finally showed up here in Asheville and while I will always try to hold on to those long hot summer days (I was born on the wrong continent for sure) I’m trying my best not to be too sad they’re over. Thinking about my Autumn/Winter sewing projects is helping that. Hey everyone, in my last post I was telling you about my fitting woes. Well you’ll be pleased to hear I persevered and finally made something that fits me pretty nicely. So, it feels like a looooong time since I posted about anything new I’ve made and that’s because it’s been a long time since I’ve made anything, blub blub, well, anything worth sharing that is! I’m attempting to continue with my #sewbackthen series as there’s not much sewing in my life currently – hopefully that will change shortly – but wanted to stay on the blogging train. For now, my tale is of my first try of my third indie pattern company By Hand London. I’d had success with Tilly and the Buttons and Sew Over It so I had no worries about trying a new indie company. As summer is coming to a close (although Asheville doesn’t seem to have got that memo yet), I thought I’d share my favourite summer dress make with you.